Much new and interesting data support the benefits of fasting in diseases other than obesity and type 2 diabetes. This often relates to the role of nutrient sensors in the body. Everybody always believes that increased growth is good. But the simple truth is that excessive growth in adults is almost always bad. Excessive growth is the hallmark of cancer, for example. Excessive growth leads to increased scarring and fibrosis. 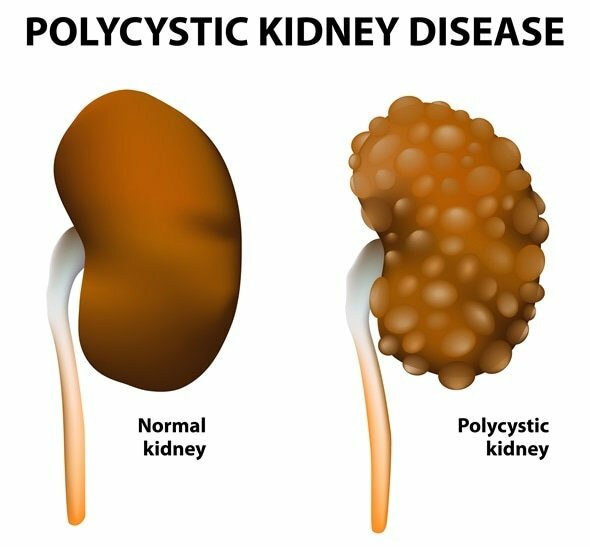 Excessive growth of cysts leads to the disease of polycystic kidney disease (PCKD) and polycystic ovarian syndrome (PCOS). Excessive growth in adults tends to be horizontal, not vertical. In most cases of adult disease, we want less growth, not more. 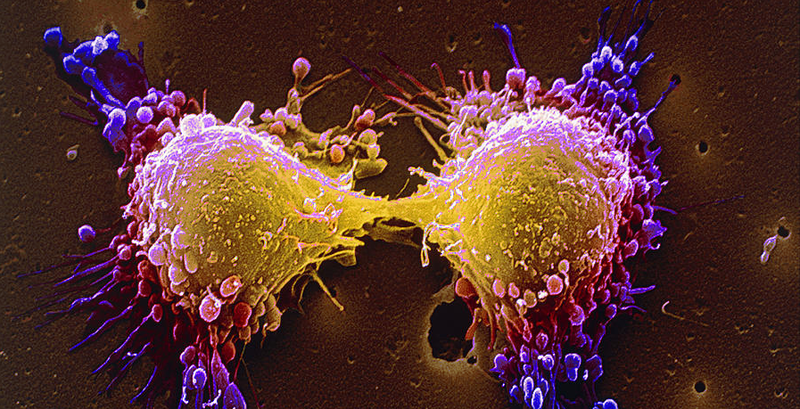 Other than cancer, there are diseases characterized by uncontrolled growth, too. So, in certain diseases, like polycystic kidney disease (PCKD) there is uncontrolled growth of fluid filled cysts in the kidney. This is a hereditary condition which is relatively common. It affects 1 in 1000 people in the general population and constitutes up to 4% of the dialysis population. The genes involved are defects of PKD1 and PKD2 which code for proteins in the polysystin protein complex, but the functions of these proteins are still unknown. These patients develop thousands of cysts in the kidney and liver, which eventually destroys the functional tissue. When the kidneys are destroyed, the patients go into renal failure and require dialysis. Since patients have this from birth, it often takes 50-60 years of this disease to destroy kidney function. Interestingly, it is hypothesized that PCKD cells may also develop metabolic adaptations compatible with an increase in glycolytic activity similar to cancer cells. Why not simply fast? In simplicity, I see elegance. Thank you Dr. Fung! could you please explain correlation between HGF and the other growth factors? Because HGF is good for us, isnt it? And it increases when we are fasting. I have a question about Apple cider vinegar/ Bitter melon.. foods that supposedly lower blood sugar. Do these work in a way similar to Insulin? Do they too shove the extra sugar in the already stuffed liver and muscle cells? Interesting – vinegar instead of metformin going to bed. Must ask my diabetic-2 friend who now has an automatic glucose monitor installed to check! Otherwise, if you are sure that your liver is not dumping glucose when your insulin drops at night (how to be sure?? ), reduce the protein intake to 0.8 g pure protein per kg target body weight. That would leave “nothing” left to produce glucose of. Gynnostemma drives excess glucose out via the bladder and can cause infection there if used long term, I understand. Tulsi tea also sounds interesting. Is it calming too? Thanks for the reply. Do you take ACV before bed or first thing in the morning? Thank you, Jerome, for sharing your knowledge and your YouTube library. I wish Dr. Fung saw a few more younger patients and had more interest in nutritional supplements. He’s wonderful anyway, of course. As you have pointed out earlier, fasting saves time and money. My breakfast now is just a cup of tea. I only eat lunch if I’m hungry, such as after a gym workout, and dinner is something to enjoy most evenings. Always real food freshly prepared. Mostly low carb, but giving in to tempting treats to avoid cravings without falling into bad habits. I forgot to mention that I have an extensive library of journal articles on starving cancer, gene swapping with macrophage, glutamate (glutamine) as fuel source, mega vitamin C (Linus Pauling), at http://healthfully.org/rcdm/ . Yes Pharma frames the discussion to promote drug sales. It seems he is already fasting. Try to get him to eat what is allowed on a ketogenic diet. Mainly fats like butter, coconut oil, avocados, and vegetables in vinegar and olive oil. Google “ketogenic dishes” for many more alternatives. No. It was all due to the cancer. A low carb, high fat diet is beneficial for cancer patients, this is the link for the newest study I heard of. but carrots are full of natural sugars so would feed cancers so this would not be beneficial. they’re full of vitamins and minerals too. carrot juice is a large part of the gerson therapy and there are many that have had success with it. its like the body knows and tries so hard to get us to fast when we have advanced cancer but following conventional wisdom we keep eating any and every thing we can choke down thinking we need the calories. So would you say that if a patient with pcos who is morbidly obese, not diabetic and more prone to hypoglycemia is NOT getting good results on keto/lchf, they may actually get somewhere if they begin a fasting regimen? Sarah, As Dr. Fung Writes, it is more important when you eat then what you. The ketogenic diet is too easy to break. It should be also low insulin (low protein). Just skipping breakfast in a study used by Fung, they ate 539 calories less a day, which is consistent with my experience. Just lower your carbs about 50% (especially sweets), replacing them with coconut oil and butter and skipping breakfast should get much better results. As stated above check out my video page at http://healthfully.org/rg/id4.html should reinforce what I have written. I would love to have you read this and post on youtube. This is great information, but I listen as I do work or walk. I often don’t have time to sit down and read. Tom, he’s all over youtube. Just go to http://www.youtube.com and type in Dr. Jason Fung. You will be amazed! Hello, I know ovaries are NOT kidney’s, but do you have any information regarding polycystic ovarian syndrome and fasting? Hi dr Fung. I am fasting from June. I have two meals- at 8 and 1 o clock n(breakfast are 2 eggs and bacon or something like that and for lunch meat and veggie). But still do not lose weight. Also I am in ketosis. But I have PCSO and have not my period sine 10th March. Can Yuu give me any advice? Have a nice day. I have PCOS and have been fasting for a few months. I haven’t seen a difference, nor have I lost weight. I have recently begun testing myself on the fast and after 40 hours of fasting I still was not in ketosis. Could this be a result of PCOS or is it insulin related? If you never reach a state of ketosis, what other imbalances may exist for a PCOS patient? I suffer from polycystic ovarian syndrome and I feel better after fasting. Any thoughts on whether this theory would apply to lipomas? I’m prone to them and wonder if this could be an alternative to surgical removal. Just going to share this with my client who’s got PCOS thanks! I think the first paragraph relating to the cause of PCOS is misleading. “Excessive growth of cysts leads to the disease of polycystic kidney disease (PCKD) and polycystic ovarian syndrome (PCOS).” PCOS is a metabolic disorder which stems from an improperly functioning hypothalamus. Polycystic ovaries are a symptom of the disease, not the cause. There is no denying that insulin resistance, inflammation, and excess testosterone all play a roll but I don’t see how it can be lumped together with PCKD.